Whether a CRISPR-based editing tool makes the grade or needs remedial work isn’t clear until it is subjected to testing, thorough and systematic testing. Consequently, scientists based at South Korea’s Institute for Basic Science (IBS) are administering the CRISPR equivalent of standardized tests. Rather than present CRISPR tools with a #2 pencil and a fill-in-the-oval sheet, the scientists provide different guide RNAs. Then the scientists use genome sequencing to check for errors such as off-target effects. Recently, an IBS team led by Jin-Soo Kim, PhD, director and professor at the Center for Genome Engineering at IBS, studied the error rate of an adenine base editor, ABE7.10, in human cells. Such editors accomplish adenine-to-guanine changes at DNA sites specified by RNA guides. The scientists reported that they pinpointed the positions on the human genome affected by ABE7.10 and scanned for errors beyond the target. To do that, they used an adapted version of Digenome-seq, a sequencing technique that they had already used to successfully determine the accuracy of a cytosine base editor (CBE), CRISPR/Cas9, and CRISPR/Cpf1, among others. They tested ABE7.10 with seven guide RNAs, corresponding to seven DNA target letters, and also compared the results with a common CBE, and a Cas9 nuclease. The modified Digenome-seq could detect an average of 60 off-target mistakes in the entire human genome. And interestingly, although the three proteins were engineered to target the same site, they recognized different off-target points. Detailed findings appeared March 4 in the journal Nature Biotechnology, in an article titled, “Genome-wide target specificity of CRISPR RNA-guided adenine base editors.” The article described how the scientists produced double-strand breaks at sites containing inosines, the products of adenine deamination, by treating human genomic DNA with an adenine base editor 7.10 protein–guide RNA complex and either endonuclease V or a combination of human alkyladenine DNA glycosylase and endonuclease VIII in vitro. The IBS team also showed some strategies to curb the number of off-target modifications. 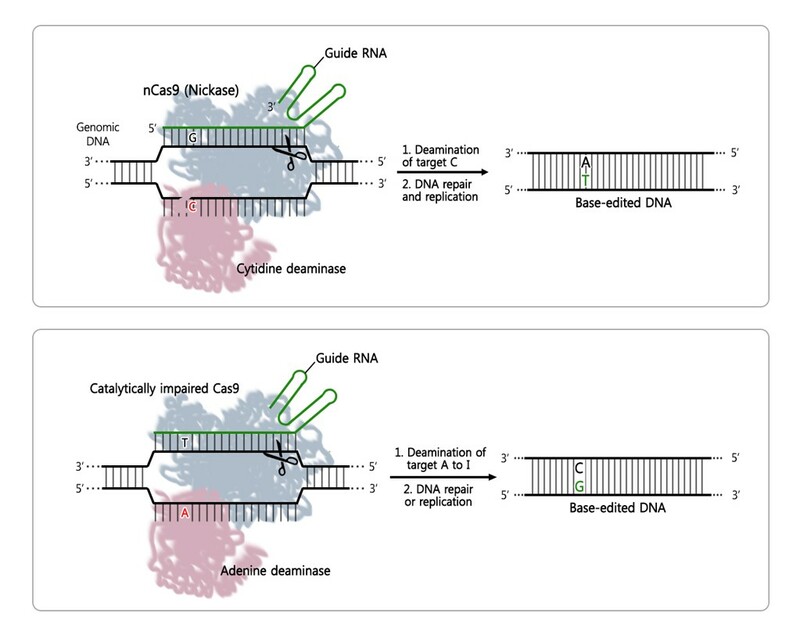 Adding a couple of Gs at the end of the guide RNA reduced the off-target mistakes, as well as the use of a different type of Cas9 (Sniper-Cas9, developed by the same team in 2018) and the delivery of ABE7.10 via preassembled ribonucleoproteins, rather than via plasmids. Going forward, the team aims to contribute to the development of ABEs that introduce the desired single-letter changes in a more precise and efficient way. “As the accuracy of the base editor is proven, we expect that it will find wide application in the future in medical and agricultural realms,” said Kim.